Rani Mukherjee will be seen essaying the role of a teacher, from her looks she will be seen nailing the portrayal. The movie speaks about the age-old premise of the student-teacher relationship. If you view the first 30 seconds trailer, you will get an idea of how the movie is going to shape. As a viewer- the first 30 seconds of the trailer gives an idea of how the film will be shaping finally. The trailer leaves us a bit conflicted at the end, as it seems like we have already seen the movie before. This is like old wine in a new bottle. Just packaged under a different name. The acting prowess which Mukherjee makes up leaves us totally excited. 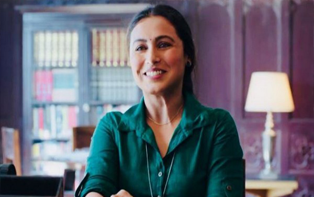 Hichki is a return of Mukherji to the silver screen after a gap of four years. This movie leaves us with an optimistic note. This is a positive and inspiring story, of a woman who is willing to turn her biggest weakness into her biggest strength. Her performance will really leave you speechless. The movie is the adaption of 2008 Hollywood film “ Front of the Class.” Mukerjee’s come back will definitely be smashing. The story is an excellent exhibition of how a woman fights back after facing numerous rejections, and several interviews. This movie is definitely an inspiration.There is no life without rejection. So we should never break down in face of difficulty and fight back to achieve our dreams. A diseased woman, who is being tremendously mocked at by her students but she fights back. There’s no life without struggle. Initially underestimated, this woman introduces a new method of teaching which proves to be the turning point for the school. This is a life-changing story fully based on the trials and hurdles which a disabled woman faces.